Please contact us for any clarification. Our Office 2010 courseware is used daily in classrooms worldwide for instructor-led training courses. Extremely high quality courseware for excellent training courses. Equip your unit now for this Office release that is taking up very strongly. The Courseware is provided in fully customizable format. The manuals and workbooks are in Microsoft Word (97-2003) format. The course data files are in their application specific 'native' format. that is to say, for example, PowerPoint course data and sample files are MS PowerPoint files. 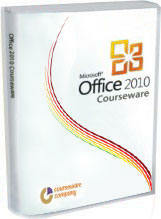 The Office 2010 courseware package will be available for download within one hour of your purchase. After your purchase you will receive an email from us stating the link location for download of the courseware. This E-mail will be sent to the E-Mail address logged as the purchasing E-Mail address reference. Fully editable customizable courseware package. 33 fully editable courses. $299 (USD). The complete Microsoft Office 2010 Instructor Led training package. With the Microsoft Office 2010 bundle of courses you get everything you need to begin training right away. Each course comes with Student/Instructor Manuals, pre-assignments, sample files, course data and exercise files and more! Having to take the time to develop your own training materials means less time actually doing what matters most - teaching. We understand the time and effort it takes to develop proper training solutions that work. This is why we give you the ability to fully edit our material. Print off as many copies as you need. Rebrand the materials with your own logo. And only pay once! Microsoft Office 2010 Migration. Upgrade to Office 2010, for users. Training Manuals - Fully editable and Customizable. Can be opened in Word and you can make any changes you like. Exercise Files - Fully editable and Customizable. We provide the sample files to use with the Exercises and methodology in the manual. Instructor and Student training manual/workbook and guide - Fully editable and Customizable. Customizable - Rights are given on a per site location to edit the content to suit the training needs or corporate environment. Instantly Available - Courses are instantly available as a download or can be shipped on DVD. COURSEWARECO courses are used every day by thousands of trainers in countries all over the world. Easy to use - All courses and materials are easily opened in Microsoft Word or any word processing program. Print-on-demand - Instructors only print what they need, when they need it. Flexible - Instructors can easily remove sections, combine courses, ‘localize’ examples, add new content, etc. Unlimited number of users - Rights are sold on a per location basis. Each location is permitted to use the material with as many staff at the location as they like (including future training). No annual renewal fees - Organizations are not required to pay renewal fees. Unlimited printing rights - Ongoing use means organizations are not limited to the number of times they can reprint the course material.